Well! What an eventful few months it has been.. Few months? Hmm.. Possibly a year.. huh! I thought I'd come back on here more as an outlet for everything that I have been doing recently, and possibly put up a few fancy recipes I've been working on lately. My life has changed significantly since I last posted. My partner and I split, I moved to a new house, and met some of the most amazing people in the world! I also went overseas (England, Scotland, Wales, and back to Hungary! ), and have started a new relationship with a fantastic person. Before you ask, yes I still get to see my dogs (Suzie and Radley), though my ex has custody, we are still good friends, which allows me to spend as much time with them as I like. I do have custody of Domino (unfriendly cat), who has taken to living with Kate and myself, as she is now being fed double. I am still working at the vegan bakery, though I have been given an amazing opportunity to do some catering for another cafe in Canberra. Which means my own recipes, and much better hours! The amazing people I've met include the beautiful Katie, who has become one of the most important people in my life. She is definitely the one person I think I can tell anything at all without judgement. She let me cry at her after my break up with Travis, she helped me to get over that with lots of whisky and gin, and she even let me dye her hair blue (what a trooper)! She is an extremely smart lady who can play nearly every instrument you throw at her, and can drink most people under the table. The other amazing person in my life is Seb. Seb and I met a few months after the split, and it just so happened that he was working in the bar that I frequented with work colleagues while I was drowning myself in liquor to numb any feelings of loss and pain (mostly due to the loss of Suzie and Radley). He caught my eye immediately, though I hesitated to act due to the fact that he was now my barman (and nobody liked to screw things up with a good barman), and so I let my little infatuation go for a while. Then a while later I got very drunk. And I (very indelicately) hit on him. He reciprocated, I stalked him on Facebook, and the rest is history! We've only been dating for ten months, but things seem to be traveling along smoothly. My parents adore him, he is extremely smart (studying industrial design at the University of Canberra), hard working, and an amazing person to talk to. Katie loves him too, which means our dates are frequently crashed..
Needless to say, I love him. OK! Well it seems we're mostly caught up! If I think of anything else, I'll be sure to put it up, but for now I'll start collating some of my new recipes for putting up! So this week I decided, as my last week of having to bake using yeast, to make brioche. Now i'm not sure if you're familiar with it, but if you aren't (as I wasn't before baking in class), it is a french pastry, traditionally made of many eggs and LOTS of butter, which make it basically a really unhealthy form of bread.. YUM! At school this meant using a lot of butter, and lots of eggs to make this gloopy dough, which when baked turned into a very very very fatty muffin (not sure why, but they made us bake it in muffin tins). Slowly add milk and yoghurt/egg replacer. Add in the butter gradually, and make sure it has been softened (so not straight out of the fridge). Make sure each piece of butter has been well incorporated before adding the next piece. Once combined, take the mixture from the bowl and place on a lightly floured bench top. Once the dough is well rested (hah! 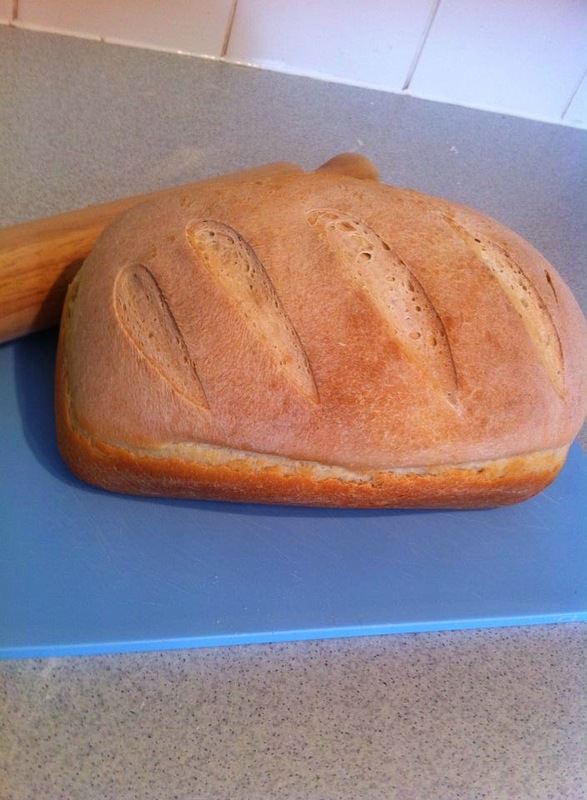 ), turn it out onto the bench again to knead (or knock back). Knead it for a minute or two. Divide the dough equally into the muffin tin (or you can use a loaf pan, whatever suits you! ), and round the little dough mixtures in your hands, so they are smooth over the top. Spray the balls with some canola spray, then place somewhere warm to prove. Put in the oven when the dough is springy, and bounces back to shape when you poke it with your finger. Remove from oven once the tops are golden. So we like these plain, or with some Nuttelex, but you can fill them with so many things! We put some Sweet Williams chocolate pieces inside some, cut some open and buttered them with chocolate spread, peanut butter, Tofutti Better than Cream Cheese, the possibilities are endless! At school they made savoury spreads for them, so you can always make something yummy out of the cream cheese! I've been complaining since we got here about how expensive it is to park here, especially on school days, where I have to pay nearly $10 (in coin) to park for the day… Ridiculous! Not to mention when I go to the shops! So now my plan is to ride my bike to school, to the shops, and to work! Yay for helping the planet! Do you ride a bike in stead of driving places? Saturday has become my favourite day of the week lately. Ever since Travis has started his new job, he hasn't had to work Saturdays anymore, which is fantastic! It means we now have an entire weekend together. Wake up late, feed the dogs, have a relaxing breakfast, get all of our bags together and go to the markets, come home, make some food from our new produce, then relax. The markets we've been going to is the EPIC markets at the Exhibition Park in Canberra (E.P.I.C), on the north side. They're not far from our house, so it's a short 5 minute drive to get there, and there is always good parking. We've found that it is easier to just walk around and pick things as we see them, rather than taking a list, then getting anxious when there isn't things from our list there due to the climate in our area, or the season. So the fun part about market shopping is that we find things there that look fantastic (the pumpkins at the moment are beautiful! ), and decide what we will eat that week from there! After the markets this week Trav had to do some work, so I decided I wanted to bake some bread. It is one of the most relaxing and rewarding jobs to do at home I think. Mainly because it is just such a home-y thing to do, it saves a bit of money (if you eat as much bread as we do), and the smell is just intoxicating! There aren't many smells that can top a fresh bakes bread in the oven..
Flour is so cheap, and the other ingredients are always sitting in your pantry anyway, and you can make it however you like it! Next weekend I'm thinking of getting some yummy olives to put in a loaf, and having one that is all for me :) (Travis loathes olives). After baking, we sat down and watch some of the first season of 90210 (the 1990's version), and although Travis finds it insipid, we both spent most of the night watching and laughing at their oversized computers and "mobile" phones. For dinner we decided to make home-made pizza and twists, topped with fresh garlic and home-made queso cheese (I'll post a recipe, it is DE-LISH!). The pizza turned out amazing, and the twists were great as a starter! I know, I know, not the healthiest day for us, but hey! That's what Saturdays are for aren't they? Do you bake your own bread at home? What do you put in yours? As you may have read in my previous post, we've just moved to the beautiful city of Canberra, are living in an amazing little house in the inner suburbs, I'm studying patisserie at a school near us (which is amazing! ), and I recently got a new job at a vegan bakery!! BAKING! It IS pretty amazing though. The cafe is called Sweet Bones Bakery, and it is located on Lonsdale St, within the Lonsdale St Traders in Braddon (a suburb just out of the city). It is very groovy, and hip, and I am far too nerdy to be socially adequate in many of their cool situations, but it is seriously, the best job I've ever had! They bake vegan wedding cakes and cupcakes, and make so many cool things! I've so far made their lemon cheesecake (YUM), cupcakes, cookies, brownies, muffins, pretzels (yummy!) and I'm sure there's more. The only down side to this job is that I am surrounded by delicious and decadent vegan food all day, and there are chefs there who are willing to make me a tofu burger any time.. Sounds upsetting right? Yeah, well my waistline is not happy about it!! :-P So if any of you are ever in Canberra, feel free to drop in and try some ah-mazing food and come say hello! 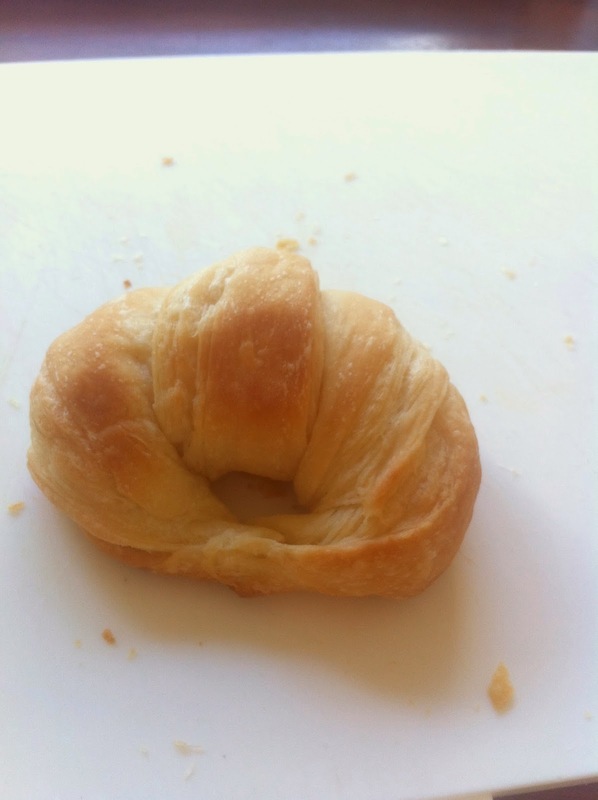 Did any of you check out my vegan croissant recipe? It's up! And it's beautiful :) PLEASE tell me if you make them, and if they turn out well! For anyone who is vegan, I know there are many things you think you'll never eat again, including delicious flaky croissants. These babies were made using completely cruelty free ingredients! And we know they're not perfect, they're all a little oddly shaped. But they are all delicious! Of course I quickly smothered it in more Nuttelex and devoured it. Enough drooling over the pictures! Let's get baking!!!! Mix all dough ingredients together in a Kitchen Aid (or similar) until dough is elastic. Add more water (cold), or flour as needed. Melt the shortening, mix through the margarine until completely combined and smooth. Refrigerate. Remove dough from fridge and roll out into a rectangle. Remove butter from fridge once semi-set and lay down cling wrap on bench. Place the butter on the cling wrap, and mould into a flat square around half the size of the rectangle dough. Cover butter square in cling wrap, and replace in fridge until cold. Once cold, unwrap the square of butter, and place on one half of the dough. Once acclimatised, grab a rolling pin and roll out the rectangle (forward and back - not sideways to create a long rectangle) until about 2-3cm thick. NB Please be gentle in this section! You do NOT want the butter coming through the dough! If you do, get a pinch of flour and sprinkle over before continuing to roll, and do not roll much further. After rolling out, take one side of the rectangle, and fold it 1/3 of the way over the middle, then fold the other side over the top - These are the beginnings of the beautiful layers! Rotate the folded dough around until a folded side is facing you. It should look a bit like an S shape facing your body. Roll out again, forward and back, until the dough is around 2-3cm thick. If the butter starts coming through please be careful, and sprinkle some flour over the top. Place on a chopping board and cover in cling wrap, refrigerate for around 10 mins. Take out of the refrigerator and place on the bench so that the folds are facing you again to repeat the rolling process again. Re-fold, place the folds to you, and re-roll. Continue cutting along from left to right, leaving around a 10cm gap between cuts. Using the second cut from the left as the starting point, slice down to the bottom left corner, to create 2 triangles. Follow along the dough in the same way. NB Sharp knives are the best for this, the dough won't bunch up as much when cutting. Take your first triangle, and make a small cut between the top 2 points of the triangle, and stretch out the sides. Roll the dough up from this side, stretching out the tip slightly to elongate the roll. Place the tip on the bottom of the rolled dough, and attach the two ends to each other to create a weird circle. Look at these little cuties!!! Let the little croissant prove while you complete the rest of the rolls. Place somewhere warmish to prove. Place on a well greased tray in oven at 160C for around 15-20 mins depending on your oven. Mine is not great, and not fan forced, nor is it gas :( so it kinda depends on how yours operates, but i prefer to cook mine for longer at a lower temp to make sure it cooks all the way through. While the little beauties are baking, place water and sugar in a saucepan over moderate heat. Dissolve the sugar, and let it simmer until it becomes like a watery syrup, then take off heat. Once the croissants are baked, take out of the oven and cool until they can be handled. Waiting for the croissants was tedious for myself, and the cat. Dip the top of the croissants in the glaze and let set - PLEASE NOTE that if you want these to be savoury croissant, e.g. with a yummy vegan queso or something in it (recipe soon! ), then DON'T glaze!!! If you're not choosing to sugar glaze yours, brush them with some melted vegan margarine before baking. Et voila! Holy mother of vegan baked goods! FEAR NOT! Vegan croissants are possible! I am so gosh-darned proud of myself right now! I will have a recipe up soon!! !